Dalmatians have been around but there is still total disagreement as to their origin, but one thing that seems to have been established is that the breed in ancient and may have originated from some of the spotted dogs mentioned in history that came from Africa, Europe and Asia. There were also traces of spotted dogs found in some of the Egyptian friezes. There are those that believe the breed has its origins in Croatia. The American Kennel Club first registered them in 1888, and the Dalmatian Club of America was started seventeen years later. At KUSA they were first registered in 1895. In the middle ages it was used as a hound dog, and later on, about 1800 they became very popular as carriage dogs, trotting next to them and guarding the carriage and horses while their master was away from it. The Dalmatian has been associated with fire fighters for many years and is often found as their mascot, but do you know why? They were used to chase away rats in both fire stations and the horses stables (remember fire engines used to be pulled by horses!) 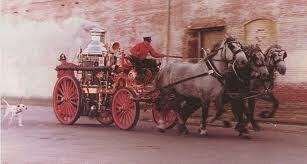 and guided the fire fighters through the streets of London. Even today many fire stations have the Dalmatian as their mascot. These dogs are very people oriented and they have a wonderful sense of humour and are natural clowns. When they are trained and properly socialized these dogs can be wonderful companions, with good manner and a quiet disposition and make great guard dogs. However, they do have a very boisterous side due their unbelievable energy and as they are dogs with great stamina, this can be excessive if not curtailed and directed into appropriate activities. Dalmatians are very intelligent yet they have a reputation for not being very bright. In fact, they are often too smart for their own good. They are just like small children who enjoy playing one family member against another when they sense inconsistency. They have a tendency to be independent thinkers. This can be a hard combination to deal with for inexperienced owners. The are not a dog to leave to its own devieces in the garden or they will get bored and end up digging holes all over and chewing objects. They need regular and vigurous exercise and being part of the families daily life is a necessity. Do they get on well with children? Due to their boisterous nature they may not be the best dog around small children, being better suited to older children. One good wag of a tail ( seems to always be wagging) can send a young child flying. If you have a child that love to run, play, ride their bikes, they make excellent companions. As with all children, ensure that your child is 'dog savvy'. Be a firm but gently handler and if possible engage in activities such as agility, fly ball, obedience work. Supply them with the exercise and stimulation they need. Allow them to be part of your daily family life. Ensure that you get your pup from a KUSA registered breeder, as these dogs are prone to deafness, sometimes one ear, other times both and the stats are relatively high at about 10-12% being born deaf. A test should be done called the BAER ( Brainstem Auditory Evoked Response Testing) test which is done at about 6 weeks and you should be shown the results. Please bear in mind however, that there is nothing wrong with a deaf dog - they can be trained and can adapt to family life easily. Use force methods of training. Dalmations respond better to the positive training methods. As with all pups, early socialization should be done as well as continued socialization. As these dogs are natural watch dogs, this is very important in this breed. Due to its stamina, endurance and exuberance, Dalmations need to have training and are not the ideal dog for first time dog owners. These dogs respond better to the positive manner of training. Although they have a short coat they are know to shed a lot and additionally shed heavily twice a year, and daily brushing is recommended. Their hair is the type that due to the colour and consistency tends to show up on furniture, fabrics etc, so rather teach your Dal to lie on its own bed on the floor. Overall a healthy dog, but as mentioned they are prone to deafness. Dalmatians have a relatively low incidence of hip and elbow dysplasia but it is wise to select a puppy from OFA certified parents. Dalmatians have a uric acid anomaly that can lead to the formation of urinary stones, which can lead to urinary blockages. This breed is also prone to skin allergies. Most Dalmatian puppies are born with all white coats which do not begin to show spots until they pups are about two weeks old. Dalmatians are also known as Firehouse dogs, Carriage dogs, or Spotted Coach dogs. This breed was mentioned in letters by a poet named Jurij Dalmatin which was written in the mid 1500's. Dalmatians enjoyed a huge boost in popularity after the book "101 Dalmatians" was published in 1956. Dalmatians are often recommended to people who are allergic to dogs because their fur doesn't trigger symptoms the way most coated breeds do. Dalmatians often curl their lips in a way that resembles a human smile. George Washington is believed to have owned a Dalmatian.